A massive bomb detonated in Afghanistan’s capital this morning, killing 80 and wounding nearly 350 others in what makes now the sixth deadly attack during the Islamic holy month of Ramadan. The bomb appears to have been packed in a sewage tanker truck that exploded during Kabul’s morning rush hour in what the Associated Press calls “a highly secure diplomatic area” near multiple embassies. It “sent towering clouds of black smoke into the sky near the presidential palace,” Reuters reports on location. Also damaged: French, Turkish and Chinese embassies, though none reported injuries to personnel. No group has claimed responsibility for the bombing yet this morning. But SITE Intelligence Group says the Afghan Taliban have already denied any role in the attack, which turns “suspicion on the increasingly violent Afghanistan branch of the Islamic State of Iraq and the Levant,” The Telegraph reports. Here are two maps of the attack scene, courtesy of Agence France-Presse and Reuters, here and here. What next? “The explosion will add pressure to the fragile government of President Ashraf Ghani, which has faced mounting discontent over its inability to control the insurgency and provide security for Afghan citizens,” Reuters writes. As well, “U.S. 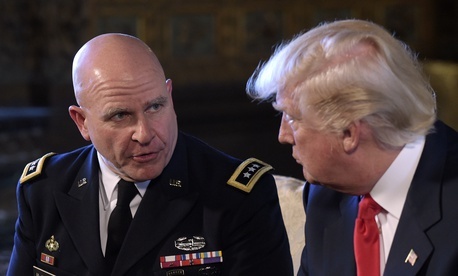 President Donald Trump is due to decide soon on a recommendation to send 3,000 to 5,000 more troops to bolster the small NATO training force and U.S. counter-terrorism mission now totaling just over 10,000.” More here. Pentagon Wants to Get Started on New Air Force Two and Doomsday Planes // Marcus Weisgerber: The aging C-32 and E-4B may be replaced by similar aircraft, or at least with planes that share some gear. The Biggest Bills for the Iraq and Afghanistan Wars Are Yet to Come // Linda J. Bilmes: Benefits for World War I veterans didn’t peak until 1969. Here’s a way to keep 21st-century vets’ expenses from eating the U.S. budget. The Trump Administration Just Missed Its Best Shot at a Military Buildup // Katherine Blakeley: In its first year, when big changes are easiest, the White House chose domestic cuts over national security. North Korea Is Helping China in the South China Sea—Whether It Knows It or Not // Steve Mollman: Pyongyang’s rocket tests have elbowed Beijing’s land grab out of the spotlight — just as the Chinese might have hoped. Hitting a bullet with another bullet. The U.S. military destroyed “a mock intercontinental ballistic missile over the Pacific with a new hit-to-kill vehicle meant to protect the homeland against the growing threat from North Korea,” Military.com reported after Tuesday’s test from Vandenberg Air Force Base in California. “The launch of a Ground-based Midcourse Defense, or GMD, interceptor missile…against an ICBM-class target fired from the Reagan Test Site on Kwajalein Atoll in the Marshall Islands resulted in a ‘direct collision,’” according to the Missile Defense Agency. Tuesday’s launch marked the first intercept test of the GMD system since 2014, and the first against an ICBM-class target—bringing the system’s stats to now 10 for 18 overall, and two for last five attempts, writes Kingston Reif, missile specialist at Arms Control Now. “This system is vitally important to the defense of our homeland, and this test demonstrates that we have a capable, credible deterrent against a very real threat,” Missile Defense Agency Director Vice Adm. Jim Syring said in a statement following Tuesday’s test. The contrarian’s view: “At best [the GMD] system provides limited capability to defend United States against a small, unsophisticated ICBM attack,” Reif wrote on Twitter after reading Syring’s statement. Why? The “tests are undertaken in a controlled, scripted environment (for some legit reasons) and the system was given info in advance that no real enemy would provide.” It also hasn’t been tested against more than one target, he adds, “or by firing multiple interceptors against a single target. Nor has the system yet demonstrated a capability vs. decoys and countermeasures that an adversary could use to fool the system, including North Korea.” For where to go from here, read Reif’s recent write-up on the topic in War on the Rocks, here. For the record: The U.S. has spent $330 billion trying to develop ICBM interceptor technology, Stephen I. Schwartz, a military analyst at the Middlebury Institute of International Studies in Monterey, Calif., told The New York Times. “Yet neither the high cost nor the poor performance has dampened enthusiasm in Congress or at the Pentagon — or among military contractors — for deploying missile defenses. The Defense Department hopes to spend billions more dollars on the interceptors, including perhaps on a new site on the East Coast,” the Times writes in their wider look at the “urgency” around Tuesday’s launch. Also on Tuesday, “B-1B bombers flew near the Military Demarcation Line that divides North and South Korea,” The Wall Street Journal reported. “North Korea accused the U.S. of staging a ‘nuclear-bomb-dropping drill’ with the bombers, which it sees as a new provocation in addition to the presence of the USS Carl Vinson and the USS Ronald Reagan, two aircraft carriers that are operating near the Korean Peninsula.” More here. Happening today at 10 a.m. EDT: Adm. Syring speaks to the press at the Pentagon by phone. Stay tuned for what shakes out of that. Happening in 2018, maybe: The next intercept test of the GMD system, Kingston Reif adds. That test is supposed to be another first—firing multiple interceptors at an ICBM target. Will Trump pull the U.S. out of Paris climate accord? Yes, one White House official tells Politico, which says the move “is certain to infuriate America’s allies across the globe and could destabilize the 2015 accord.” The United States would join Syria and Nicaragua as the only countries not to participate in the largest international accord on the issue. “World leaders repeatedly pressed Trump on the issue during his recent trip to Europe, as did Pope Francis, who gave the president his papal encyclical on climate change when they met in the Vatican. Others who supported staying included Trump’s secretary of state, Rex Tillerson, and major oil companies such as ExxonMobil and Shell.” Read on, here. The decision’s not final, other WH folks tell the New York Times, here. That comes a day after this WSJ oped by McMaster: “America First does not mean America alone. It is a commitment to protecting and advancing our vital interests while also fostering cooperation and strengthening relationships with our allies and partners. 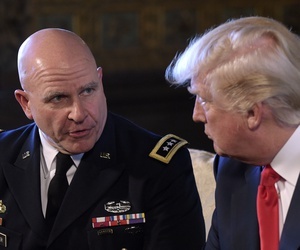 A determination to stand up for our people and our way of life deepens our friends’ respect for America,” National Security Adviser Lt. Gen. H.R. McMaster and Director of the National Economic Council, Gary Cohn write in an op-ed for WSJ. “Where our interests align, we are open to working together to solve problems and explore opportunities. We let adversaries know that we will not only take their measure, deter conflict through strength, and defend our interests and values, but also look for areas of common interest that allow us to work together. In short, those societies that share our interests will find no friend more steadfast than the United States. Those that choose to challenge our interests will encounter the firmest resolve.” Read the rest (paywall alert), here. Writes former lawyer for the U.S. intelligence community, Susan Hennessey: “For context, all of this information was in Flynn’s public, retroactive FARA [Foreign Agents Registration Act] registration from March. WSJ just obtained some of the footage” of the documentary. U.S. military arms the Kurds in Syria ahead of the formal start of the offensive on ISIS-held Raqqa, NBC News reported Tuesday. Not a lot more detail to that story from President Trump’s relatively tight-lipped defense officials. But you can read a bit more, here. AFP says Russia notified the U.S., Turkish and Israeli military ahead of the launch. More here.